Yesterday evening I met up with my friend for further discussions about our book idea. We’re really going to do this thing! Well at least we’re going to put together a proposal. 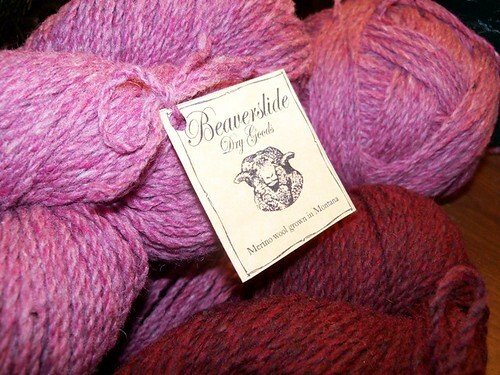 Also I’m FINALLY starting Gwendolyn – in my new Beaverslide yarn. This project has been sitting in a bag taunting me for all of the christmas knitting season. I can’t wait! In the mean time, my patterns keep coming. I’ve got another one ready to go which I think I’ll release next wednesday, do you remember this from August? 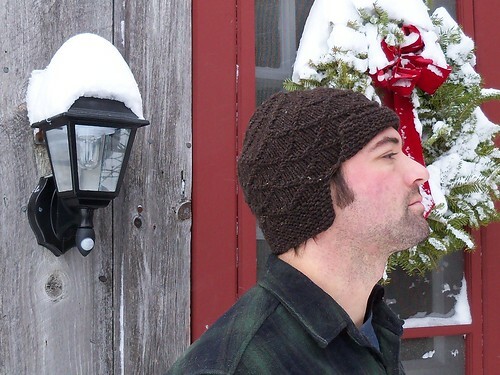 A squooshy embossed diamond hat with a unique garter stitch brim. A plain black hat worked up with plenty of texture; it has enough purl stitches to keep it squishy and a split garter stitch brim. Dunkelipa* is named after a dark IPA beer Neil was brewing up the same day I brewed up the pattern. The brim is split on just one side. I really like wearing it folded up in the front but down in the back to keep my neck warm. Of course you can fold it any way you like – options are good! 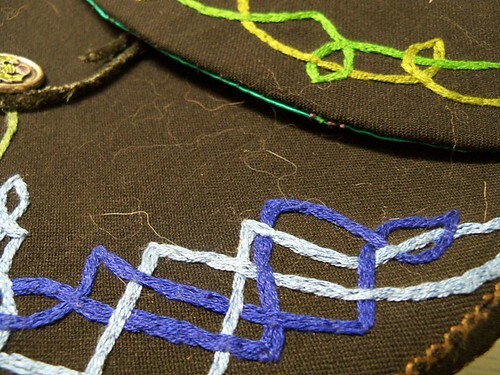 The purl stitches travel around the body of the hat to create diamonds and at the crown the decreases are worked into the purl ridges that spiral around to the top. The pattern gives 4 sizes from 15.5 to 22.25 inches and each size uses a single skein (or less) of the yarn. 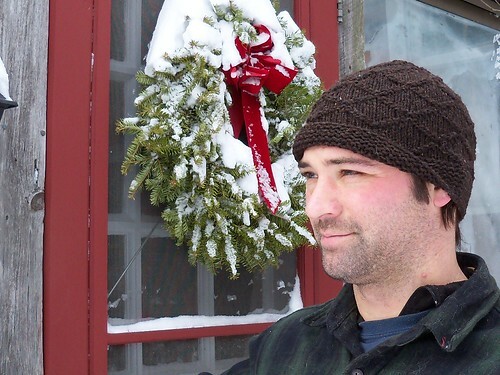 It’s a very economical hat and (or) an opportunity to try a fancy new yarn. Clicking the button above will take you to paypal. As with all my patterns you do not need to have a ravelry account to purchase; although the automatic payment and download would not be available without the support provided by the great folks at Ravelry! 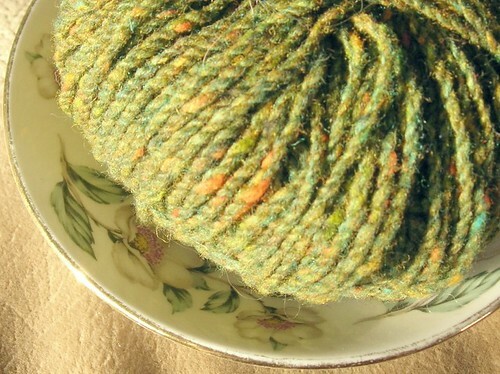 If you’re on Ravelry, you can queue and favorite Dunkelipa here. 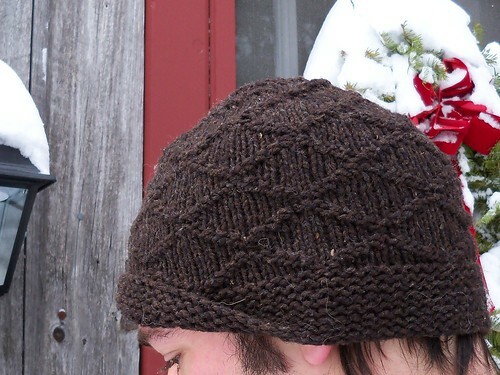 This pattern has been tech edited by Joeli Caparco (Joeli on Ravelry). *therefore this made up word is pronounced dun-kel-i-pa or just dunkel I P A if you’d prefer. Everyone’s snowed in and it’s really cold, right? (at least on the east coast) Maybe it’s time for some soup. 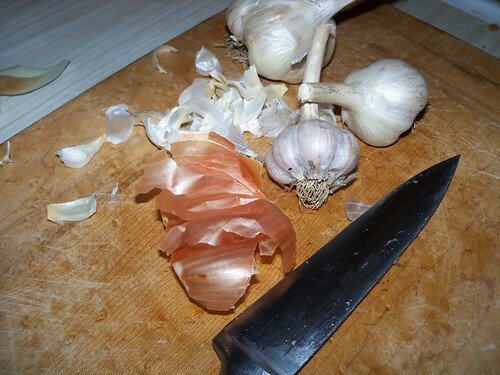 We eat a lot of garlic in my house. Neil likes to put on his best mainah* accent and say “HA! Garlic Soup!” All. The. Time. I’m not sure why, but it turns out if you say something to me enough times, I’m going to try and do something about it. In this case I actually made garlic soup, and it came out really well. 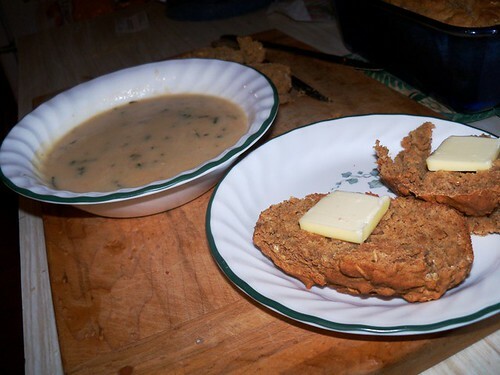 I just riffed off of cheddar beer soup, so really, how could it have gone wrong? Melt the butter in a sauce pan on medium heat, add the onions and garlic and let them fry in the butter flavoring the oil. Add the flour and whisk around so it absorbs all the butter. Continue to whisk and allow it to brown. Add the beer, just a little at a time so it’s absorbed into the butter/flour mix. Continue whisking, try to keep it from getting lumpy. Add the milk and spices/herbs and bring the soup to a low simmer. If I owned an immersion blender I’d blend it smooth here, but it wasn’t bad with onion chunks in it. Whisk in the grated cheese, add any final seasonings and serve! This made enough for 2 for dinner plus leftovers for lunch for one (in other words, serves 3) We had ours with quick beer bread. Personally I use dark beer in the bread and light beer in the soup. **If your house is anything like mine you buy the Sam Adams Winter Classics especially for the Chocolate Bock. Then you mourn the loss of the Cranberry Lambic, drink the Fezziwig Ale, and Holiday Porter. Then the lagers stare at you from the back of the fridge. Use them in this soup instead of ignoring them forever. Waaaay back in January I signed up for a project in Ravelry called IntSweMoDo2010 – the International Sweater-a-Month Dodecathon. Yes, I am crazy, but the craziest part is I pulled it off! The rules were simple, 12 finished adult sized tops in 12 months – so a few vests or summer tops make the challenge a little more do-able. 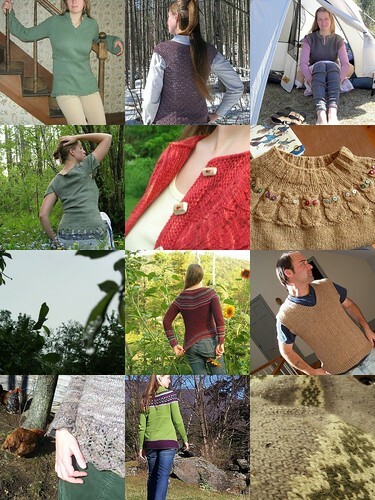 You may notice that 5 of these were the sample sweaters for my own designs*. 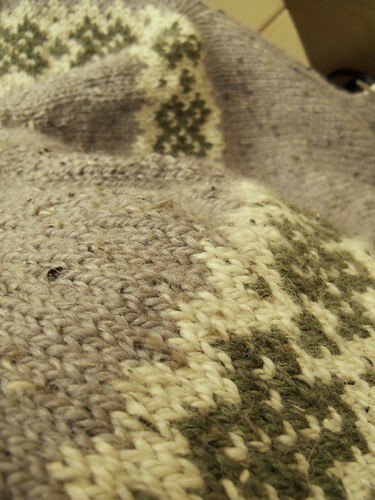 Designing requires knitting on a tight deadline and that fits in with knitting a sweater a month pretty well. Challenges like the sweater in two weeks issued by Kate Gilbert back in June helped everything along. I gave myself a few advantages: January’s sweater was half done by the 1st of that month and the Something Different top and Subtle Stripe vest were quick. 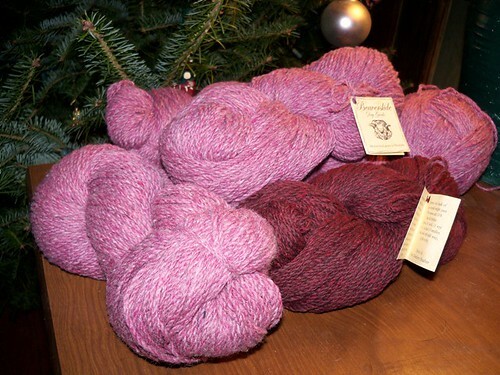 But these were probably offset by knitting hyssop at 7 stitches to the inch and spinning my own yarn for Elisa. I really enjoyed the challenge. It forced me to stay on task, but only once or twice did I worry about failing. It helps that I knit fast and I knit constantly. I still have a few sweaters in progress (this was supposed to be the year I finished my Autumn Rose fair isle, but that didn’t happen) and I have two sweaters I’m really excited about knitting for 2011 already! 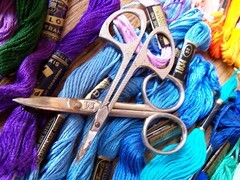 But at the same time, I’m looking forward to knitting some more accessories in the next 12 months. *In fact, I can’t show you July’s sweater yet! This is the condition of my brain. Random, scattered. I’m hoping to pull some pieces together tomorrow during my day off while making some apple chutney and (finally!) getting some christmas baking done. We’ve been living without a stairwell light for 2 years – convinced it was broken. I changed the bulb last week, and now it’s all better. I didn’t even need a step ladder to reach. This isn’t the first time we’ve thought a fixture was broken, and it turned out to be just the bulb. 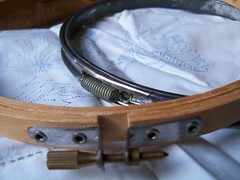 One major goal for 2011 is to revamp my older patterns. I’m saving up for good pattern layout software right now. Once I have that, I’ll start redoing the layout. In some cases I want to re-write the whole thing, in others I just want new photography. So expect me to talk more about them once I start the process. I have 3 (three!) patterns close to done right now. Winter light is making the photography really hard. 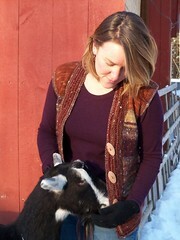 My friend Calley (from Fat Toad Farm), and I have started thinking about books. We may actually put a submission together pretty soon. I don’t want to say too much and jinx it. But dude, I think we’re pretty awesome, so I think anything we create will be pretty awesome too! This is going to be the smallest family Christmas ever. One brother is in South Carolina, one is at bootcamp, my younger sister is in New Mexico, my aunt and cousins are all in Florida. That leaves one set of grandparents, me, Neil, my sister and her new husband, and my parents. 8 people total is tiny, when you’re used to 16 PLUS significant others. 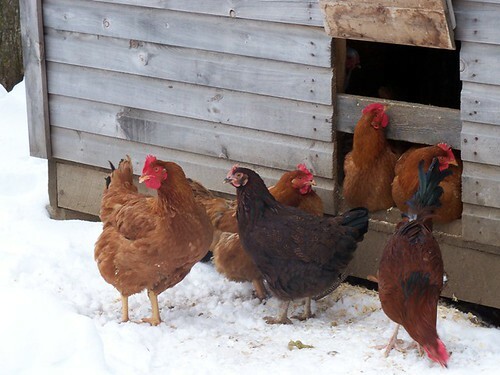 Chickens don’t like getting cold feet. Out coop is big enough they frequently don’t venture outside even if I think it’d be good for them! They’ll spend a lot of time just sitting in the doorway, watching the outside. But nobody likes to be cooped up all the time. So I tried to keep a short path clear from their door to the plowed driveway. The brahmas have feathered feet, so I’m not really surprised they came outside. 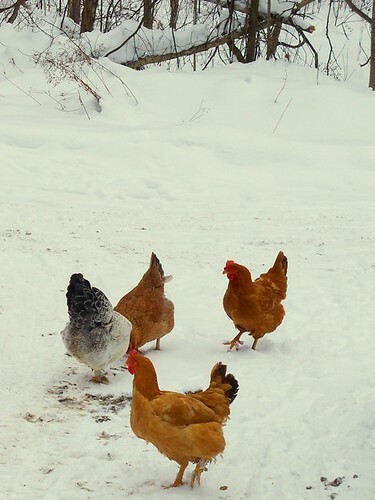 The remaining meat birds are either brave or stupid, and come out to play in the snow most often. And then there’s Myles. He must’ve seen the wild birds visiting their feeder, and decided to investigate. 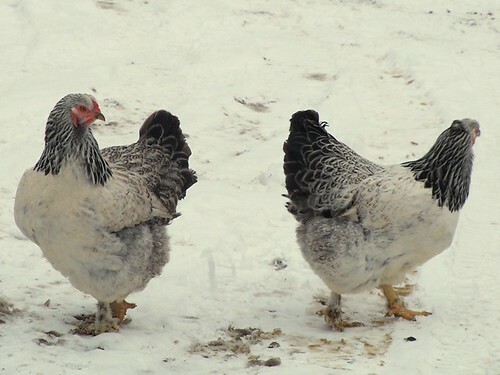 I’ve never seen a chicken happily shoulder deep in snow before! It isn’t Christmas time for me until I get to see the Revels performance, including this poem. I hope you had a good longest night – did you see the eclipse? It was snowing at my house so I didn’t even set the alarm. Winter has been in my little corner of Vermont since November, and it is far from over. At the same time, the days will be getting longer now. I’m looking forward to walking the dogs in the daylight again, someday. 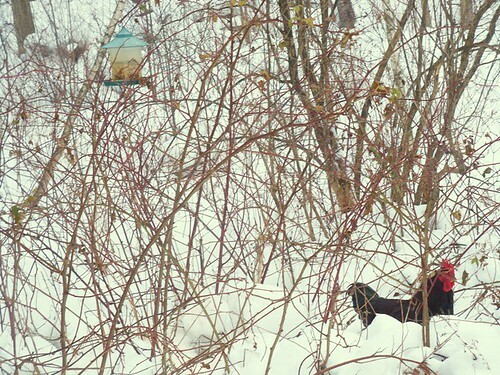 Winter seems longest in the gray days of February, but it feels darkest right now. I ride the bus in the dark to and from work; all the daylight happens while I’m away from home. It’s been an odd advent season for me. My tree is about the only thing I’ve gotten right. I haven’t done my usual baking, crafting, home made gifts, or donating. But it will be here soon whether I’m ready or not. I’m just going to attempt to enjoy the holiday, since it’s far too late to make up everything I’ve missed in time for the 25th. The title here was almost “now I can blow my nose in Victorian style” but that seemed kinda long. 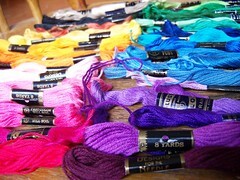 Over the weekend I did, in fact, get embroidery supplies from my mom. She has a basement full of crafty goodness, it’s a wonderful thing! Then, I set right to work, and made a boring white hanky all pretty. It’s not perfect, I can see lots of flaws in the stitching, but it sure is pretty! 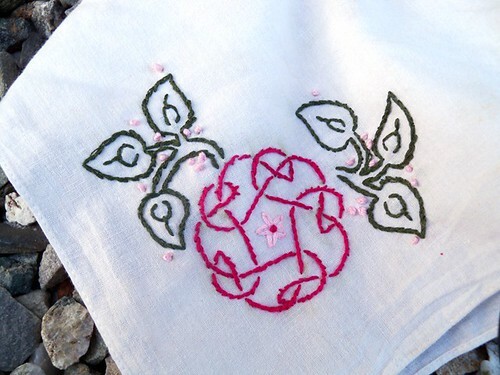 I used a celtic knot pattern and some leaf images that have lived on my hard drive for years. I transferred them to the hanky using my monitor as a light box. I didn’t have any other transfer supplies (fancy markers, paper, none of that) and necessity = mother of invention after all. I even managed not to mark up or ruin my monitor AND picked a water soluble pen. It was all sheer luck on my part, but I couldn’t have planned it better if I’d tried. But at least the knitting is all done! Just in time too, because yesterday when I got home a package was waiting for me! And I’ll be knitting Gwendolyn! My friend Amy’s NEVER knit a seamed sweater before. In spite of being a proficient knitter she’s afraid of a little seaming. 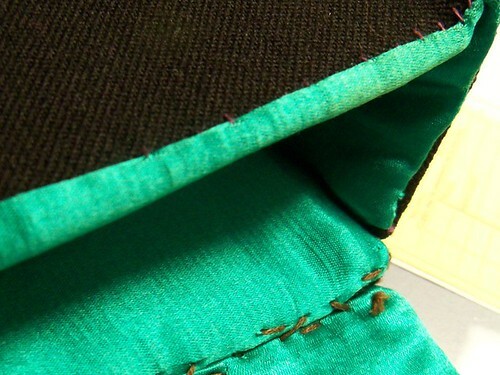 I believe being able to seam opens up new opportunities! Even if you don’t like it, it’s a skill every knitter should have under their belts. So I volunteered to lead her in a knit-along-of-two for seamed sweaters. * I was planning on choosing something cabled (because – shock – I’ve never knit a fully aran styled sweater) so when she said she was doing Gwendolyn that made my decision easy! *enabler, pusher, or just bossy? 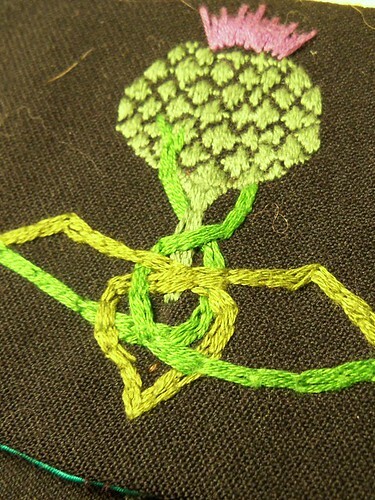 Thanks for the embroidery links! 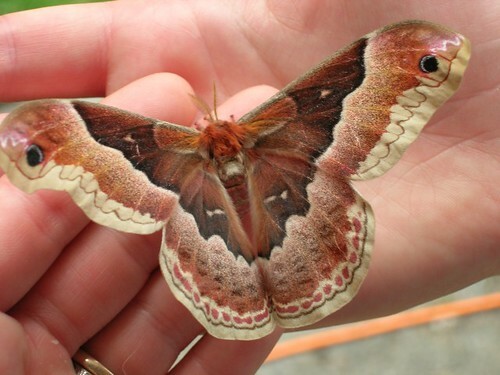 The only thing preventing me from buying a kit* from the internet RIGHT NOW is knowing that my mom will bring me embroidery supplies from her basement this weekend – aren’t parents great? 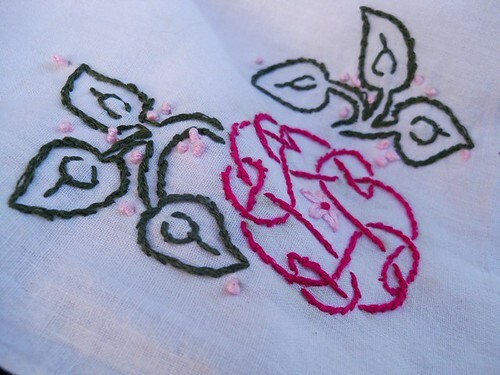 But I’ve also been thinking back to the ONE embroidery project I ever did. My freshman year in college (long before I had a blog, or even knew how to knit) I was going a little stir crazy without my sewing machine. 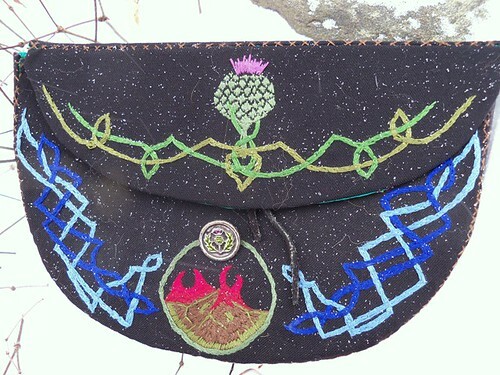 So I decided to make up a hand sewing project – a prettily embroidered hip bag to go with my renaissance faire costumes seemed like just the thing. I’d never been a fan of sewing seams by hand, but doing a little seaming and a lot of decorating seemed like a good compromise. 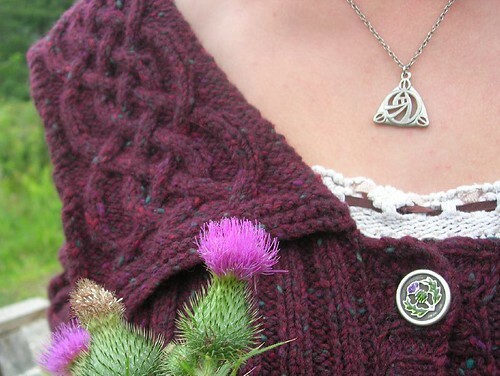 And they had thistle buttons. 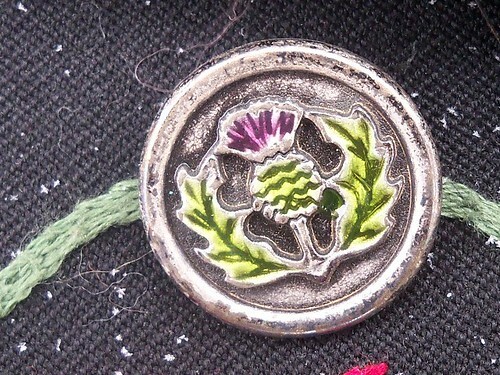 Since I have scottish heritage, and had already decided this needed to be celtic themed, the button was perfect. 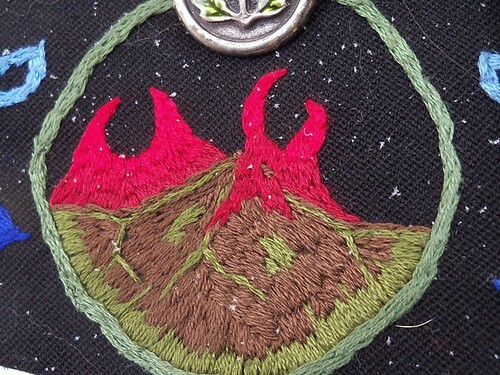 a mountain in flames – the Grant family emblem. **and I’ve clearly been designing celtic cables since LONG before I knew how to knit them.